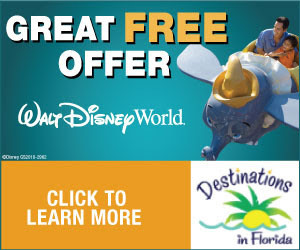 Save up to 30% on rooms at select Walt Disney World® Resort Hotels: Savings apply for stays most nights March 14, 2014 - April 12, 2014 and April 20, 2014 – June 15, 2014. Add more Character to your vacation, with this advance Card member booking offer. Upgrade to a room and ticket package with a minimum 4-day Magic Your Way® Ticket and get one more ticket day FREE! (Minimum 4-day Magic Your Way® Ticket required.) Offer excludes campsites, 3-bedroom villas, Disney’s Art of Animation Resort—The Little Mermaid Standard Rooms and The Villas at Disney’s Grand Floridian Resort & Spa. LAST WEEK TO SAVE! Save Up to 25% on Rooms at a Disneyland® Resort Hotel: Save up to 25% on rooms at a Disneyland Hotel most Sunday through Thursday nights from January 5th through April 10, 2014. Book through January 28, 2014. SeaWorld Orlando and Aquatica Orlando for $99: Enjoy two amazing parks for one amazing price. Get all the splashes of SeaWorld® Orlando and Aquatica, SeaWorld's Waterpark™ Orlando. This ticket gives you one single-day admission to each park and is valid until February 28, 2014. SeaWorld Orlando and Busch Gardens Tampa for $99: Enjoy two amazing parks for one amazing price. Get all the splashes of SeaWorld® Orlando and the thrills of Busch Gardens® Tampa. This ticket gives you one single-day admission to each park and is valid until May 15, 2014. With this offer, take advantage of FREE round-trip transportation from SeaWorld to Busch Gardens. For pick-up locations and to make a reservation for the Busch Gardens Shuttle Express. Reservations are highly recommended, due to demand. Up to $300 to Spend on Anything You Want: Book select 2014 cruises by February 28, and Royal Caribbean Cruise will give you up to $300 to spend during your vacation. Use it anyway you choose. Go snorkeling, dive into a specialty dinner for two or discover pure bliss at the spa. Up to $400 to Spend on Anything You Want: Book select 2014 cruises in Europe by February 28, and we'll give you up to $400* to spend during your vacation. Use it anyway you choose. Dive into a specialty dinner for two or discover pure bliss at the spa. Celebrate Miami Cruise Month Up to $50 in Spending Money: Book any Majesty of the Seas® sailing in 2014 between January 1 – January 31, 2014, and receive up to $50 to spend on just about anything. Go parasailing in Nassau or put it towards a massage at the VitalitySM Spa.